Inside a Docker container, there are two ways in which data can be kept temporarily. By default, files created inside a container are stored in the writable layer of the container. You do not have to do anything, but every file that is created by an application or the user and written in this layer is temporarily. This means, when the container is stopped or killed and a new container is deployed, the data is lost. You can avoid this lost, if you restart the container that was stopped using its ID, but if your data is important, this is not an option. If you do not need your data to persist beyond the container life, there is another performant option to save your data: a tmpfs mount. This is a temporary mount that uses the host memory. It has the benefit of faster read and write operations, but it is more volatile as the above option. In this case, if the container is stopped or restarted, you lose the data and you cannot get it back. If you want your data to exist even after stopping or killing the container, there are two ways to persist your data beyond the life of a container: bind mount and volumes. Bind mounts enable to persist your data by binding a file or directory structure of the host system inside the container. This means, the files or directories co-exist inside and outside the container. Then, processes outside the container can modify these files. Additionally, these mounts are difficult to backup, migrate or share between the containers. Sharing configuration files from the host machine to containers. E.g. if you need to share the DNS resolution, you can bind /etc/resolv.conf or /etc/hosts files. Sharing source code or build artifacts between a development environment on the Docker host and a container. 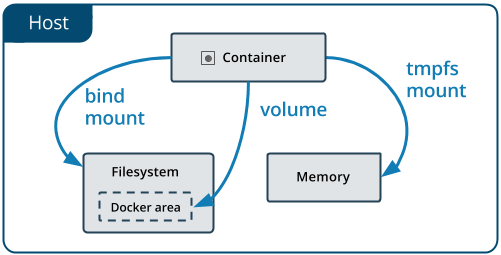 This article explains how to deal with data in Docker containers. If you need to persist your data, you should use bind or volumes. Volumes are the preferred way to persist data in Docker containers and services. They are portable, and the data and files inside cannot be directly modified by the host system. If you need more information about how to "manage data in Docker", please refer to the official documentation. Nigel Poulton has also an excellent book about Docker: Docker Deep Dive. The book updates regularly and on leanpub (I do not have any association nor I do not receive any support from, I just find it nice) you can get always the actual version. This book is my reference for Docker.